The Harbor Porpoise (Phocoena phocoena) is one of six species of porpoise. Credit: Erik Christensen/Wikipedia. (Phys.org)—A team of researchers in China has solved the mystery of how porpoises are able to locate tiny prey using sonar with wavelengths that seem too large to be of much use in such applications. 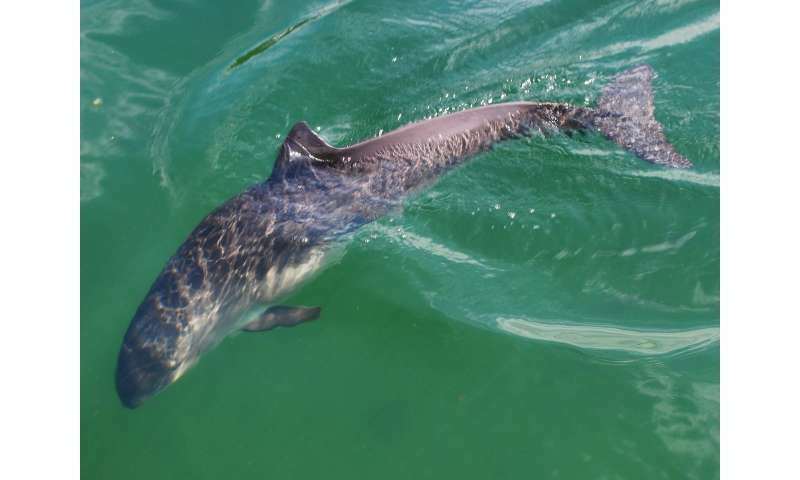 In their paper published in the journal Physical Review Applied, the group explains studying the sonar signal-generating parts of porpoise anatomy and what they found by doing so. Dolphins and porpoises are known to use echolocation to find their way around underwater and to spot prey and predators alike. Their echolocation abilities involve producing high-frequency directional acoustic waves that bounce off objects, which the dolphins read as they come back. Scientists have been studying their sonar abilities for many years because of how well it works—their biological systems are far superior to technologies we humans have devised. In this new effort, the researchers claim to have resolved one of the mysteries of the small-toothed whales known as finless porpoises—how they use large wavelengths to "see" small prey. Prior research has shown that the sounds produced by porpoises and other cetaceans are generated in the forehead. The sounds that are echoed back are received by nerves in the jaw that pass on information to the brain. To gain an even better understanding of how the porpoises generate their signals, the researchers used computer tomography to get a better look at the creature's forehead. They discovered that the forehead was actually far more complex than has been thought, and that several parts work together to adjust sonic beams as they are emitted. This, they note, allows an individual porpoise to expand the beam for discerning small nearby objects. The researchers found that the unique physical layout of bone, air sacs and muscle in the forehead was arranged in such a way to allow fine-tuning the acoustic field. They refer to the structure as a metamaterial because it can be altered on demand. They found that a porpoise can tune its beam to become narrower or wider depending on what it wants to detect. More information: Directional acoustic wave manipulation by a porpoise via multiphase forehead structure, Physical Review Applied, 2017. Porpoises are small toothed whales, and they can produce directional acoustic waves to detect and track preys with high resolution and a wide field of view. Their sound source sizes are rather small in comparison with the wavelength so that beam control should be difficult according to textbook sonar theories. Here we demonstrate that the multiphase structure in a porpoise's forehead is the key to manipulate the directional acoustic field. Computed tomography (CT) derived the multiphase (bone-air-tissue) complex, tissue experiments obtained the density and sound velocity multiphase gradient distributions, and acoustic fields and beam formation were numerically simulated. The results suggest the control of wave propagations and sound beam formations is realized by cooperation of the whole forehead's tissues and structures. The melon size significantly impacts the side lobes of the beam and slightly influence the main beams, while the orientation of vestibular sac mainly adjusts the main beams. By compressing the forehead complex, the sound beam can be expanded for near view. The porpoise's biosonar allows effective wave manipulations for its omnidirectional sound source, which can help future development of miniaturized biomimetic projectors in underwater sonar, medical ultrasonography, and other ultrasonic imaging applications.